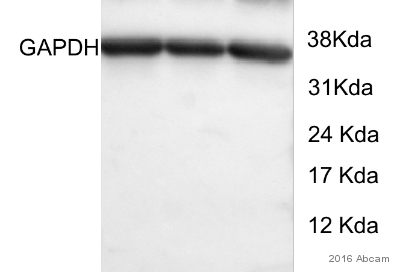 In western blot, this product typically gives a lower signal in rat lysates compared to human and mouse lysates. 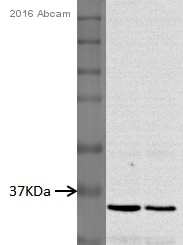 Full length native protein (purified) corresponding to Human GAPDH. For Western blotting, do not use milk for blocking. Our labs have extensively tested the blocking conditions for this antibody and recommend using 5% BSA for 1 hour. The comparison data is shown in the images section. 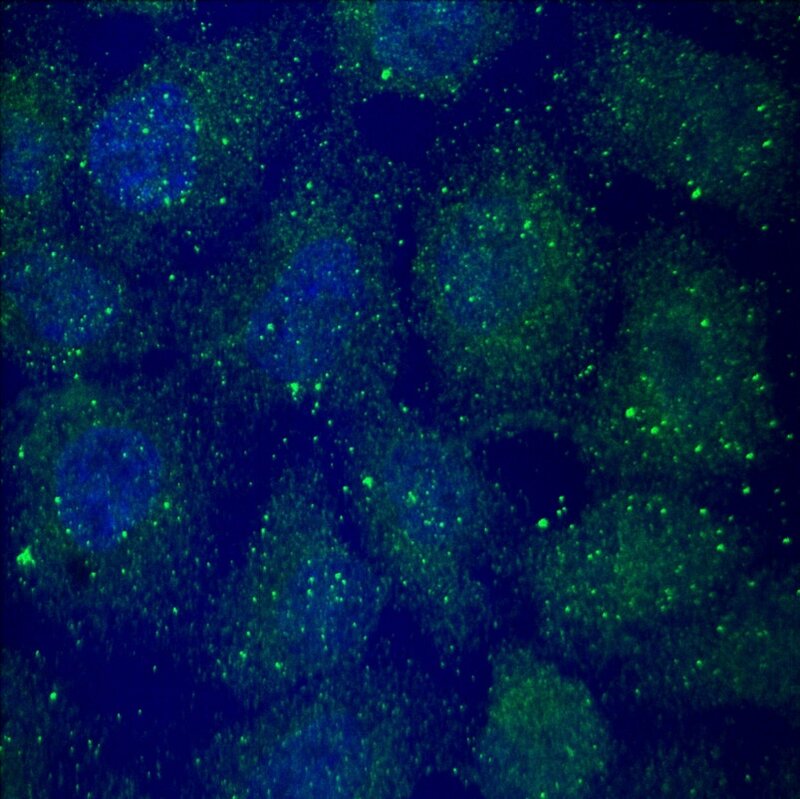 This antibody clone [mAbcam 9484] is manufactured by Abcam. Our Abpromise guarantee covers the use of ab9484 in the following tested applications. WB Use a concentration of 0.1 - 1 µg/ml. Predicted molecular weight: 36 kDa. Do not block with milk. Block with 5% BSA for 1 hour. Our labs have thoroughly investigated the blocking conditions for this antibody. We found that milk significantly decreases the signal and is therefore not a suitable blocking agent for this antibody (see images). 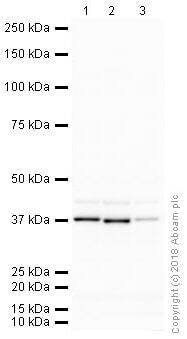 ab170192 - Mouse monoclonal IgG2b, is suitable for use as an isotype control with this antibody. The membrane was blocked in 5% BSA in TBST for 1 hour, then incubated for 1 hour in primary antibody diluted in TBST. Observed band size: 40 kDa why is the actual band size different from the predicted? The membrane 1-5 was blocked in 5% milk (1 hour). The membrane 6-10 was blocked in 5% BSA (1 hour). Milk is not a suitable blocking agent and significantly decreases the signal on the membrane. IHC image of GAPDH staining in human liver FFPE section, performed on a BondTM system using the standard protocol F. The section was pre-treated using heat mediated antigen retrieval with sodium citrate buffer (pH6, epitope retrieval solution 1) for 20 mins. The section was then incubated with ab9484, 5µg/ml, for 8 mins at room temperature and detected using an HRP conjugated compact polymer system. DAB was used as the chromogen. The section was then counterstained with haematoxylin and mounted with DPX. Overlay histogram showing HeLa cells stained with ab9484 (red line). The cells were fixed with 80% methanol (5 min) and then permeabilized with 0.1% PBS-Tween for 20 min. 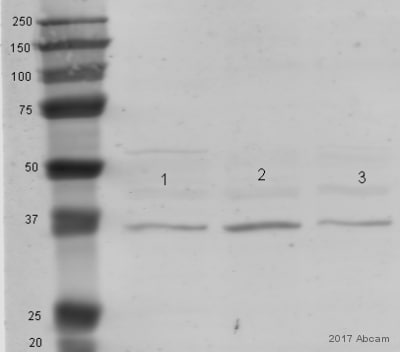 The cells were then incubated in 1x PBS / 10% normal goat serum / 0.3M glycine to block non-specific protein-protein interactions followed by the antibody (ab9484, 1µg/1x106 cells) for 30 min at 22°C. The secondary antibody used was goat anti-mouse DyLight® 488 (IgG H+L) (ab96879) at 1/500 dilution for 30 min at 22°C. Isotype control antibody (black line) was mouse IgG2b [PLPV219] (ab91366, 2µg/1x106 cells) used under the same conditions. Acquisition of >5,000 events was performed. Publishing research using ab9484? Please let us know so that we can cite the reference in this datasheet.